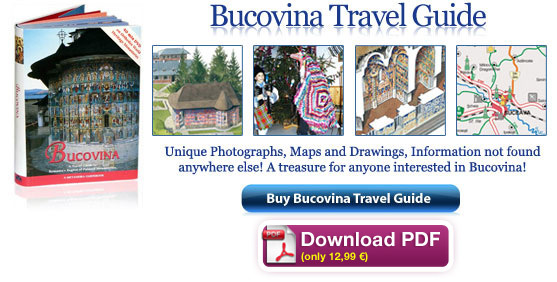 The Metropolitan Cathedral of Moldavia and Bucovina. 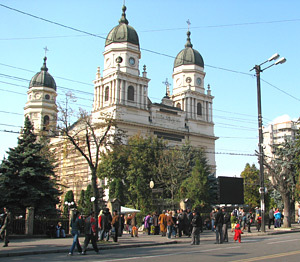 Located on the place of two churches from the 15th and 17th century, The Metropolitan Church from Iasi was built after Domnitor Sandu Sturza’s decree of 8 August 1826. The cornerstone was put and the construction was built in the times of Metropolitan bishop Veniamin Costachi, between 1833 and 1839. The plans were made by architects Freywald and Bucher. Unfortunately, the church remained in ruins until 1880 because the central vault had fallen. 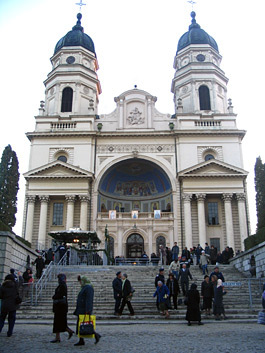 Then, in the times of Metropolitan bishop Josef Naniescu there followed reconstruction works that were finished in 1887, following architect Alexandru Orascu’s plans. Inside the Metropolitan Cathedral, Iasi. Catedrala Mitropolitana (the Metropolitan Cathedral) was dedicated on 23rd of April 1887, in the presence of King Carol I. 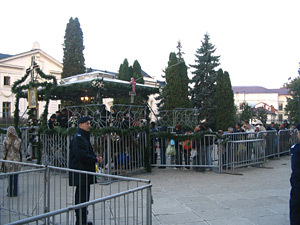 Two years later, the shrine with Pious Saint Parascheva’s relics (Moastele Sfintei Cuvioase Parascheva), the protector of Moldavia, for whose celebration, on 14th of October there come thousands of pilgrims from our country and from abroad, was brought from Trei Ierarhi Church. The cathedral has a rectangular plan, with four derricks at corners, presenting decorative elements in Baroque style. The interior paintings were made by Master Gheorghe Tatarescu. Influences of the Italian neoclassicism are to be noticed in the four biblical scenes from the vaults of the central naos, and also in the saints’ faces. The Metropolitan church has three dedication days: Sfanta Cuvioasa Parascheva (Pious Saint Parascheva) (14th of October), Intampinarea Domnului (The Presentation of the Lord) (2nd of February), Sfantul Mucenic Gheorghe (Saint Martyr George) (23rd of April). 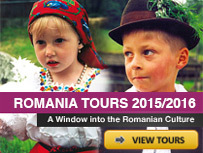 Hundred thousands of pilgrims come every year to see Saint Parascheva’s relics. The building of The “Sf. 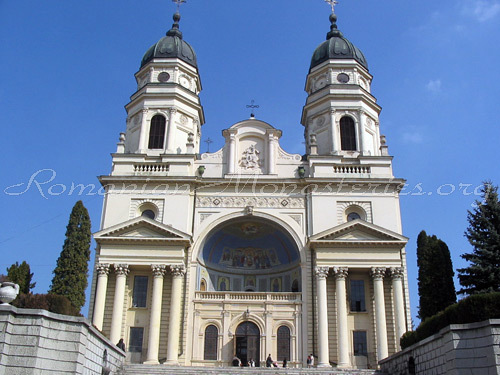 George” Church, known as the old Metropolitan church, is located inside the metropolitan complex and it was built between 1761 and 1769, its founder being Metropolitan bishop of Moldavia Gavriil Calimachi, the former Metropolitan bishop of Thessalonica (between 1475 and 1760). 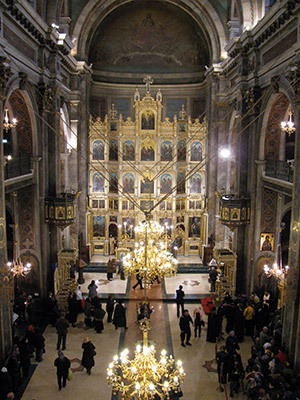 Inside the church there are the tombs of founder Metropolitan bishop Gavril Calimachi and of other prominent figures of the Moldavian Metropolitan Church: Leon Gheuca, Jacob Stamati, Meletie, Sebastian. 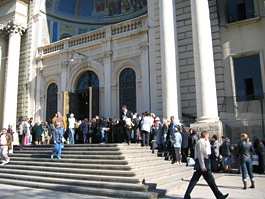 The church was renovated between 1981 and 1985, when IPS Teoctist was a Metropolitan bishop. 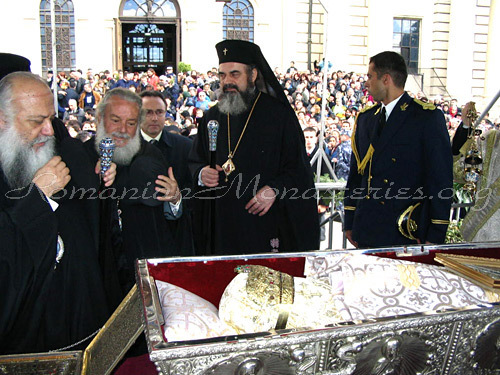 Then, in 1999, the church was given back to the divine cult, with Saint Theodora from Sihala as its dedication day, being rededicated on 22nd of May 2000 by Christodoulos, Archbishop of Athens and prelate of the Church of Greece, and Metropolitan bishop Daniel. 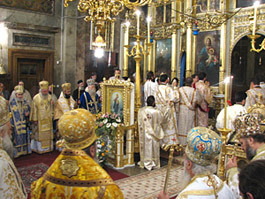 Religious service inside of Metropolitan Church from Iasi at the Saint Parascheva’s relics. 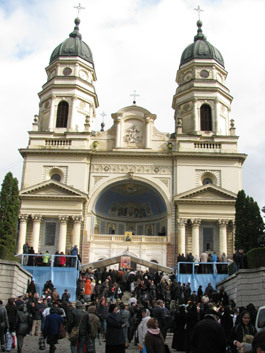 Every year hundred thousands of pilgrims come to see Saint Parascheva’s relics located in the Metropolitan Cathedral in Iasi. The Patriarch Daniel at the Metropolitan Cathedral from Iasi at the Saint Parascheva’s Dedication Day. 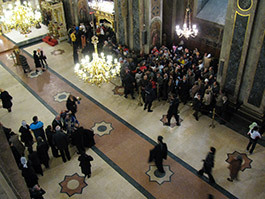 Pilgrims waiting in a line to see Pious Saint Parascheva’s relics. 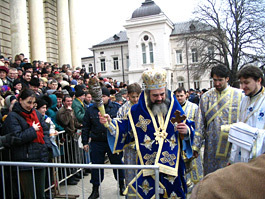 Every year, on the Saint Parascheva’s Dedication Day, the shrine with her relics is carried in front of the Metropolitan Cathedral.